The festival date changes every year. This is because it follows the lunar calendar, based on the movement of the moon. Usually, it falls on a day between mid-January and mid-February. In 2018, Chinese New Year falls on February 16. Traditionally Chinese New Year lasted from the last day of the Chinese calendar to the 15th day of the first month. It is a major Chinese holiday. In countries and territories that have high populations of Chinese, Chinese New Year is also celebrated. Hong Kong, Taiwan, Singapore, Indonesia and the Philippines are only a few. Chinatowns in other cities also celebrate Chinese New Year. 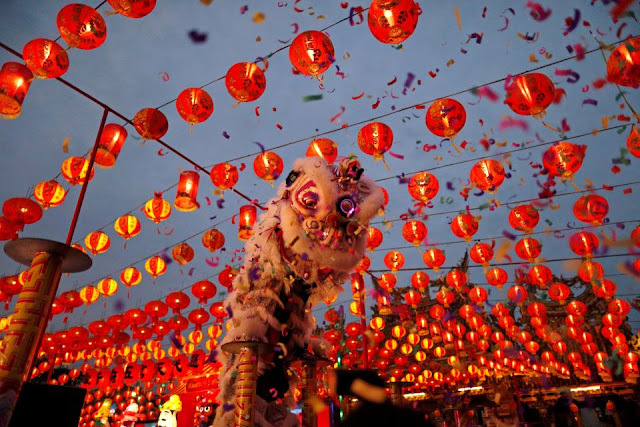 The exact date of Chinese New Year changes each year because it originated in 2600 B.C. At that time people followed the lunar calendar. The Chinese New Year is symbolic of letting go of the past and welcoming new beginnings. It's a popular time for spring cleaning. Each year of the Chinese New Year calendar is named after an animal. This is a 12 year cycle. Once the 12 year cycle is over the animal list begins again. The list in order is: rat, ox, tiger, rabbit, dragon, snake, horse, ram, monkey, rooster, dog, and pig. As the longest festival in the Chinese calendar, Chinese New Year can last as many as 15 days. Children take an entire month off of school. It's common for Chinese families to have a reunion dinner the night before Chinese New Year festivities begin. The decorations used on doors and windows are red colored paper-cuts (made similar to the way we make snowflakes). The themes of these paper-cuts are of happiness, good fortune, longevity and wealth. Firecrackers are popular during the Chinese New Year. They are thought to scare off evil spirits. Children receive red envelopes full of money instead of wrapped gifts that other nationalities give at Christmas. The amount they receive is usually an even number. The amount cannot be divisible by four. In Chinese, the number 4 means death. Dragon dances and street fairs are very popular. Dancers dress up as lions and dragons and perform for onlookers. One of the traditional treats is a candied crab-apple on a stick. Since the 1980s China Central TV broadcasts the celebration. This is an evening-long variety style show and it is watched by the entire country. On the last day of Chinese New Year, everyone carries beautiful paper lanterns and walks along the streets. This is supposed to light the way for the New Year. This day is called Lantern Day. In Singapore and Malaysia, Lantern Day is their form of Valentine's Day. On Chinese New Year everyone is a year older. It doesn't matter when you were born; this is like a national birthday. Another name for Chinese New Year is: The First Day of the Great Year.